The Happy Monk is located in proximity of the Garden Hotel and Taojin metro station in Yuexiu District. You will find The Happy Monk on the ground floor at 29 Jianshe 5 Ma Lu, with a terrace outside. 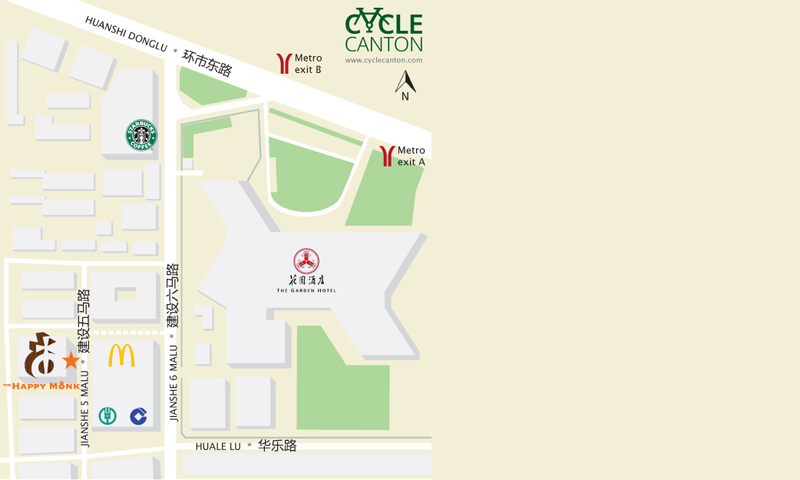 It is situated right behind the Yi’an Plaza shopping mall and office building (with McDonald’s on the bottom floor). It is uphill from the police station. If you have any trouble finding it, feel free to call me at (+86) 15626406926. After reaching the Taojin metro station on line 5 (red) it is an 8 minute walk to Happy Monk. Take exit A and make a U-turn from where you exit at the escalator, going in western direction with the large Garden Hotel on your left. You will pass a bus stop and reach a T-junction with Jianshe 6 Ma Lu, with a Starbucks across the street. Cross the street and turn left there, walking past ground-floor shops. On your left will be the large Garden Hotel. After a minute you will pass a news stand on the sidewalk and you make a right. The 'CoolHitto' is also on this corner. After making a right you take the first street on your left. This street is Jianshe 5 Malu and is going downhill. After half a minute you'll see Happy Monk on your right, with a large terrace outside. 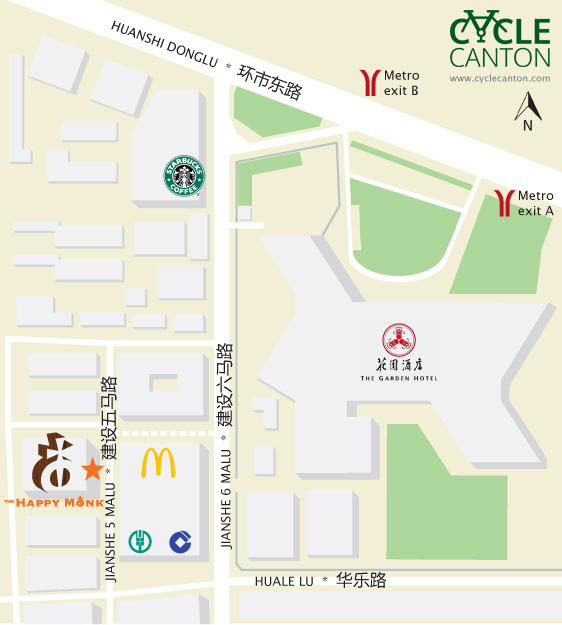 It is situated right behind the Yi’an Plaza shopping mall and office building (with McDonald’s on the bottom floor). If you reached the police station, you are on the right street but went too far downhill! The address is 29 Jianshe 5 Malu, or广州市越秀区建设五马路29号107-110铺(宜安广场后侧). People you ask will know the street and possibly place. Tours are 350RMB/adult. Reservations with upfront payment of a deposit are required for our tours. You pay the 100 RMB as deposit, with the remainder (of 250RMB for an adult ticket) settled upon departure. VISA, MasterCard, WeChat Pay and AliPay are all accepted for the deposit. The remainder can be paid in cash, WeChat Pay and AliPay (no credit cards!). For Children tickets, and Hotel Transfer you pay the full price upfront, and no remainder needs to be settled. A bike, helmet, guide, water and snacks are provided. We meet at Happy Monk cafe/restaurant (see address and directions below) at 1.20pm and finish in Zhujiang New Town on Huajiu Road around 5:30-6:00pm. Tours are available on every day of the year. Click at the BOOK section below, pick your ticket type, and finally leave your details and preferred day at the 'Booking Date' field. Please note there are several Happy Monks around the city, so make sure to find the one shown below, for which details are sent on the confirmation email too.